PASADENA >> Police sought a suspected serial bandit on Sunday after three Pasadena Subway sandwich shops were robbed in two nights, police said. Two of the robberies took place Saturday night, and another was reported on Friday night, Pasadena police Lt. Mark Goodman said. “It is believed that the same suspect is possibly responsible for all three robberies,” he said. A gunman walked into a Subway location in the 2300 block of E. Colorado Boulevard just before 8 p.m., pointed a handgun at a woman working behind the counter and demanded cash, according to the lieutenant. The employee complied, and the robber ran off. Another robbery unfolded about 40 minutes later at another Subway sandwich shop across town in the 1700 block of E. Washington Boulevard. The second Saturday night robbery closely mirrored the first, Goodman said. A robber of similar description confronted a female employee while armed with a handgun and demanded money from the cash register before fleeing. And another Subway sandwich shop robbery took place about 7:50 p.m. on Friday in the 3000 block of Colorado Boulevard. In all three incidents, police described the robber as a black man between 5 feet 10 inches and 6 feet 2 inches tall, possibly in his 30s and about 220 pounds, wearing a dark-colored hooded sweatshirt covering his face. No getaway car was seen in connection with any of the three crimes, police said. ALTADENA >> A man suffered burns to 40 percent of his body after an explosion and fire at an Altadena home being used to extract concentrated hash oil from marijuana, authorities said. Deputies were first summoned to the 1800 block of E. Midwick Drive about 4:10 p.m. by reports of a person heard screaming, Los Angeles County sheriff’s officials said in a written statement. “When they arrived they saw a male adult badly burned and flames coming from the rear of a house,” according to the statement. The process to extract concentrated THC oil, also known as “honey oil,” from marijuana plants often involves highly flammable liquids. 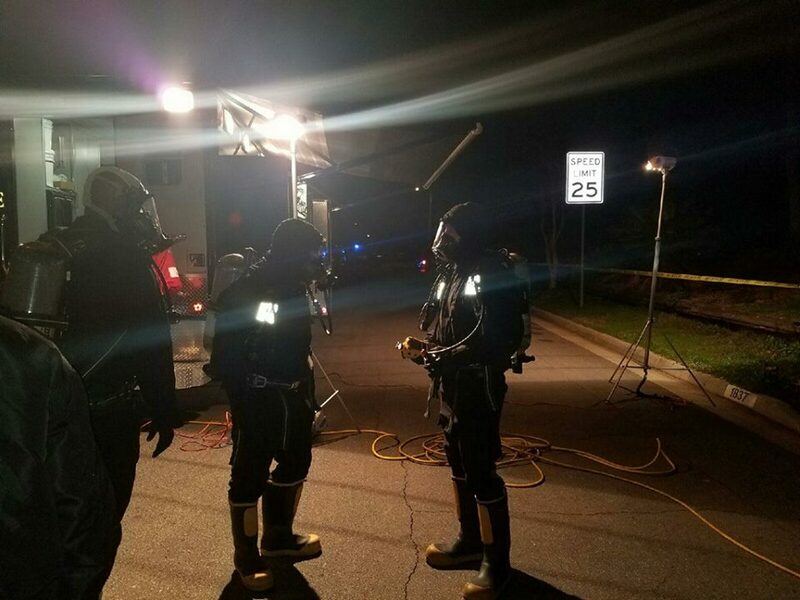 A Los Angeles County Fire Department hazardous materials team, sheriff’s narcotics detectives and U.S. Department of Justice officials investigated and decontaminated the scene in a process that lasted through 6 a.m. Saturday morning, officials said. The badly burned man was taken to a hospital with severe burns covering about 40 percent of his body. The man, whose name was not available, may face several criminal charges in connection with the alleged honey oil lab. AZUSA >> A man and woman led police on a pursuit that ended with a crash in Duarte before they were arrested late Friday, police said. Driver Dennis Ayon,, 36, of Azusa was booked on suspicion of evading police and felony drug possession, Azusa police officials said in a written statement. Passenger Darla Abriel, 30, of Glendora was booked on suspicion of a misdemeanor drug offense and outstanding warrants, according to Azusa police officials and Los Angeles County booking records. The pursuit began shortly after 8 p.m. after an Azusa police officer tried to stop the car they were riding in for a traffic violation near 5th Street and Dalton Avenue, Azusa police officials said in a written statement. Both the driver and passenger were treated for apparently minor injuries prior to booking, officials said. Further details regarding he type and amount of drugs allegedly possessed by the suspects was not available. Information regarding Ayon’s bail amount and initial court appearance was not available Saturday, as he remained hospitalized, officials said. He is already on felony probation under the terms of AB 109, records show. Abriel was being held in lieu of $45,000 bail pending an arraignment hearing scheduled Monday in the West Covina branch of Los Angeles County Superior Court. PASADENA >> A man with a handgun carried out a robbery at a Pasadena Subway sandwich shop on Friday night, authorities said. The heist took place just before 8 p.m. at the restaurant in the 3000 block of East Colorado Boulevard, according to Pasadena police Lt. Mark Goodman. “The suspect walked into the restaurant with his hood over his head and face, walked up to the register, produced a handgun and demanded money,” he said. A 22-year-old man working behind the counter complied, and the robber fled from the business with an undisclosed amount of cash, Goodman said. He was described as a black man in his 30s, about 5 feet 10 inches tall, 220 pounds, wearing a black hooded sweatshirt and gray pants. PASADENA >> Two men pistol-whipped and robbed a 61-year-old man as he arrived home in Pasadena late Friday, police said. The attack unfolded about 7:50 p.m. in the 2000 block of Summit Avenue, Pasadena police Lt. Mark Goodman said. Two robbers made their move as the victim arrived home and parked his car in his driveway, the lieutenant said. “The suspects approached the vehicle on either side and pointed handguns at him,” he said. They then opened the driver side of the door, snatching the victims cell phone, as well as an undisclosed amount of cash that was sitting on the passenger seat, according to the lieutenant. Both robbers struck the man in the head with their handguns before fleeing in a dark-colored car, Goodman said. The victim suffered cuts to his head but declined medical treatment, he added. Police described the robbers as two black men between 19 and 21. One was about 6 feet tall and 150 pounds, while the other was about 5 feet 5 feet 10 inches tall and 140 pounds. Both carried handguns. ALHAMBRA >> Police fatally shot a man who opened fire on them as they responded to domestic disturbance in Alhambra late Friday, authorities said. The officer-involved shooting took place about 7:50 p.m. in the 2900 block of West Main Street, near Huntington Drive, according to Deputy Lisa Jansen of the Los Angeles County sheriff’s Homicide Bureau. Officers responded to the neighborhood after a woman called 911 to report a “domestic disturbance” involving herself, her husband and their 25-year-old son, she said. The woman added that her son may have a gun. Gunshots rang out as officers neared the home, officials said. “When the officers positioned themselves across the street from the suspect’s residence, the suspect shot several rounds at them, and an officer-involved shooting occurred,” Jansen said in a written statement. Paramedics took the wounded suspect to a hospital, where he succumbed to his injuries, deputy Trina Schrader said. A shotgun and a revolver believed to have been wielded by the suspect were found at the scene. Video posted on social media by a witness shows two officer taking cover behind a car as they were seemingly shot at from across the street. After firing a volley of apparent return fire with rifles, the two officers are seen running toward the source of the gunfire before additional shots can be heard a little more than 20 seconds later. “Both Alhambra officers were wearing body cameras, and a review of the video footage will take place as part of the investigation,” Jansen said. Detectives from the sheriff’s Homicide Bureau are handling the investigation. Anyone with information can reach the bureau at 323-890-5500. 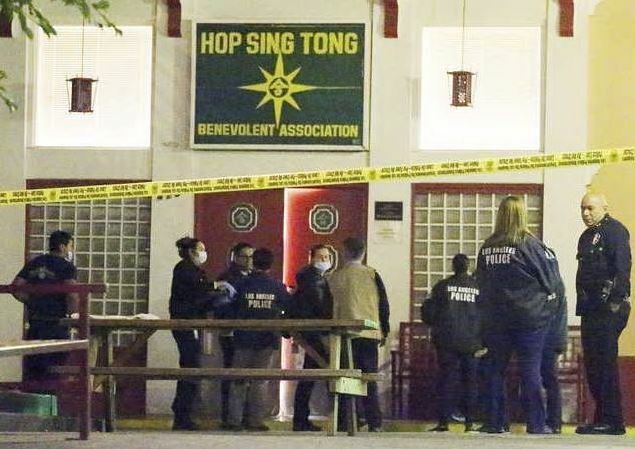 ROSEMEAD >> Police arrested a suspect in Rosemead on Friday in connection with the fatal stabbing of two senior citizens at a Chinatown social club on Thursday afternoon, authorities said. 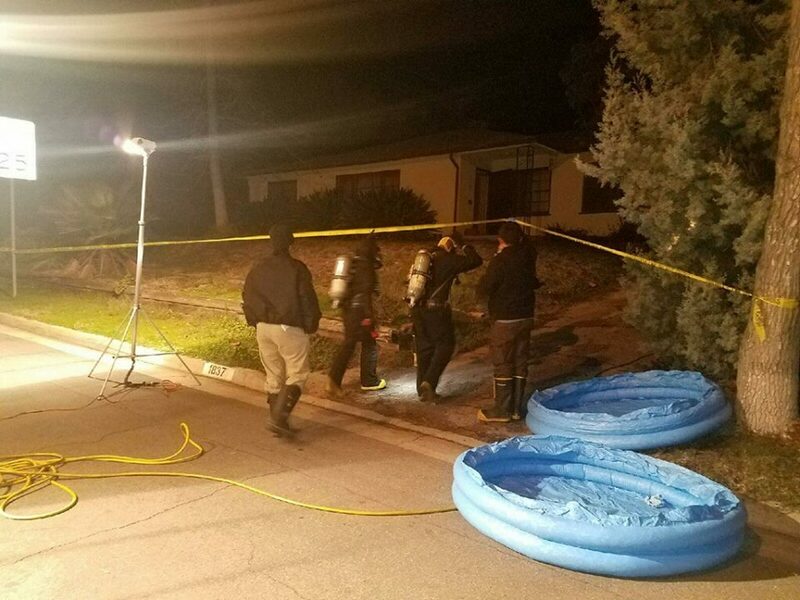 Detectives tracked down and arrested double-murder suspect Vinh Quok Dao, 37, about 4:30 p.m. in Rosemead, Los Angeles police officials said in a written statement. Dao had previously been a member of the club, but had just returned to Los Angeles after being estranged for several years, officials said. He entered the club Thursday afternoon and demanded that one of the members, whom he knew, give him $400 to pay for vehicle impound fees. Both victims died from their wounds at the scene. The attacker fled the scene, initiating a manhunt. A bloodhound was brought into join in the search, but the suspect was not found on Thursday. The attacker left behind a trail of blood, investigators said. It was not initially clear if the suspect himself was wounded, or if the blood was that of the victims. Further details regarding Dao’s apprehension were not available late Friday. Dao was expected to appear in Los Angeles Superior Court for an arraignment hearing on Tuesday. The identities of the two victims, both described as club members in their 60s, were not released Friday pending positive identification and notification of their families, Los Angeles County Department of Medical Examiner-Coroner officials said. Anyone with information can reach LAPD Detective Tricia Hauck at 213-996-1878, or the LAPD’s 24-hour tip line at 877-527-3247. Tips may also be submitted anonymously online to L.A. Regional Crime Stoppers at 800-222-8477. ALHAMBRA >> Authorities released surveillance camera images of a man and woman sought in connection with the stun gun attack and robbery of an elderly woman outside her Alhambra home earlier this month. The violent, broad-daylight robbery took place about 1 p.m. on Jan. 14 in the 900 block of East Valley Boulevard. A 72-year-old woman had just arrived home and was getting out of her car when a man approached wearing a hard had and a reflective vest, according to Alhambra police Sgt. Jerry Johnson. The woman fell, striking her head on the ground, police said. The man stole items from the woman’s purse and ran away. Paramedics took the injured victim to a hospital, where she received stitches for a laceration to her head, Johnson said. The robber was not found. He was described as a Latino man in his 30s, about 5 feet 10 inches tall and 200 pounds. About an hour after the crime, a man and woman showed up at a Walmart store in Pico Rivera and attempted to use the victim’s debit card, Johnson said. The transaction was blocked, as the card had already been cancelled. 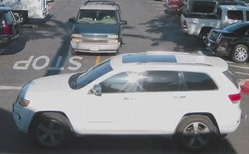 But detectives were able to gather surveillance camera images of the man and woman, as well as their white Jeep Grand Cherokee. Other attempts to use the victim’s credit or debit cards were made elsewhere in the Pico Rivera area, Johnson said. 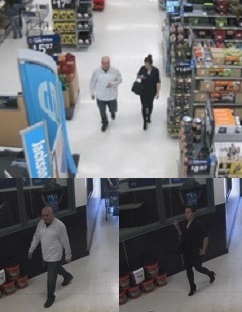 Anyone who recognizes the suspects is asked to contact the Alhambra Police Department’s Detective Bureau at 626-5709-5157. Tips may also be submitted anonymously to L.A. Regional Crime Stoppers at 800-222-8477. SOUTH WHITTIER >> Two teenagers, one of them wearing a ski mask, robbed another young man as he walked through a residential neighborhood in South Whittier early Friday, officials said. The crime unfolded about 6:40 a.m. as the victim was walking in the 11900 block of Burgess Avenue, in the unincorporated county area, Los Angeles County sheriff’s Sgt. Jaime Alvarez said. The robbers approached in a gray, BMW sedan, he said. Both got out of the car and demanded the victim’s cell phone. Once the victim handed over his phone, the two robbers got back into their car and sped away, Alvarez said. They were last seen heading south on Burgess Avenue. One of the robbers wore a ski mask, Alvarez added. Detailed suspect descriptions were not available. Anyone with information can reach the sheriff’s Norwalk Station at 562-863-8711. Tips may also be submitted anonymously to L.A. Regional Crime Stoppers at 800-222-8477. COVINA >> Covina Police Department K-9 Jarno is recovering after being attacked by a stray pit bull while walking with his handler along Barranca Avenue on Thursday afternoon, officials said. 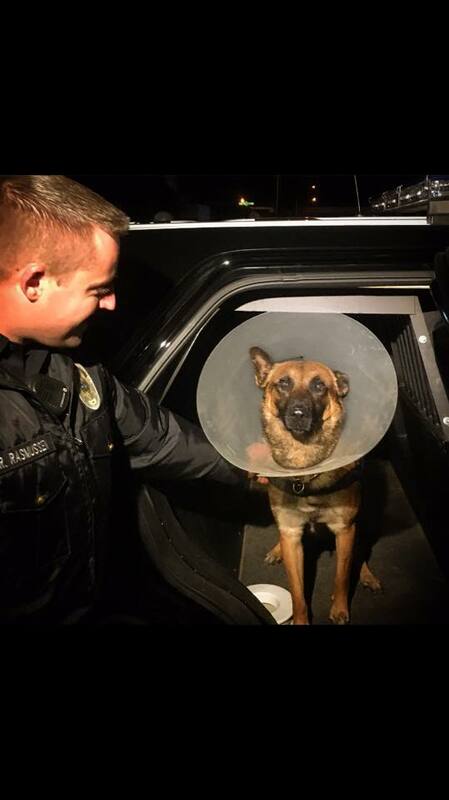 The 3-year-old Belgian Malinois, who joined the department in July of 2015 after more than 10 years without a police dog, suffered puncture wounds to his abdomen but was expected to be okay, Covina police Lt. Ric Walczak said. 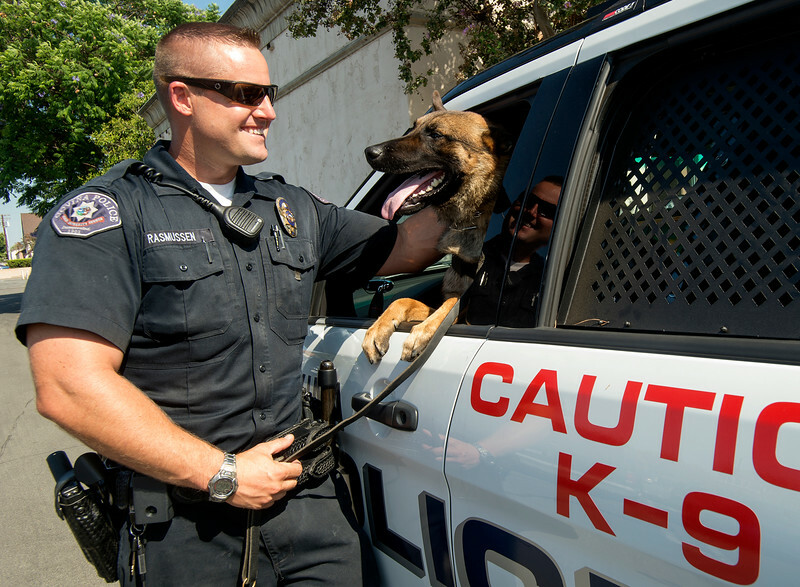 The attack took place about 4:30 a.m. in the 500 block of South Barranca Avenue, as the K-9 and his handler were heading to a fundraiser to benefit the department’s K-9 unit, the lieutenant said. “The K-9 officer, (Ryan) Rasmussen, was walking with his partner, Jarno, when a stray pit bull attacked our K-9, Walczak said. Rasmussen used a Taser to fend off the attacking pit bull, which ran off and was not found, he said. Jarno was taken to a veterinarian for treatment of puncture wounds and abrasions, police said. The injuries did not appear major, and Jarno was expected to spend about a week off duty to recover. Authorities were still seeking the involved pit bull, described as a 70-pound, dark-gray American pit bull wearing a dark-colored collar. Anyone with information can reach Covina police at 626-384-5595.